We’re thrilled to announce that Team Leader Joe Murphey was recently selected as one of the 2017 Top 100 Georgia Super Lawyers, a listing comprised of lawyers who obtained the highest votes in the 2017 Georgia Super Lawyers nomination, research, and review process. 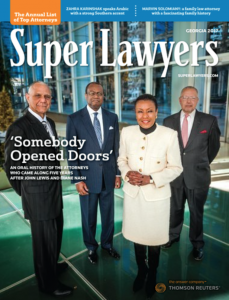 This is the 11th consecutive year Murphey has been selected as a Super Lawyer. Murphey was also selected among a handful of other attorneys as a Super Lawyer in the practice area of Alternative Dispute Resolution. Super Lawyers is a rating service of outstanding lawyers from more than 70 practice areas who have attained a high-degree of peer recognition and professional achievement. The patented selection process includes independent research, peer nominations and peer evaluations. The result is a credible, diverse and comprehensive list of remarkable attorneys. Murphey is a team leader at Miles, where he specializes in complex cases in areas of wrongful death, trucking liability, premises liability, products liability, and personal injury. He is a member of the Georgia Academy of Mediators and Arbitrators, an association recognizing the top 5% neutral attorneys in the state with substantial experience in the resolution of civil/commercial disputes, and is AV rated, the highest rating possible for ability and ethics, by Martindale Hubbell. In 2016, Murphey was also named an “ADR Champion Trailblazer” by the National Law Journal. He was the only mediator in Georgia to receive this prestigious distinction. To view the digital edition of Super Lawyers Magazine, click here.